Teletherapy: The Future of Psychotherapy? Teletherapy refers to any psychotherapy provided via media. This can include text message, chat, email, online therapy websites, telephone, etc. One of the most common forms of teletherapy used by psychotherapists today is videoconference. Videoconference sessions have incresaed in popularity recently because it most closely mimics traditional in-person therapy and also because it has become so accessible to anyone with a personal computer or smartphone. The history of teletherapy goes back further than many might suspect. 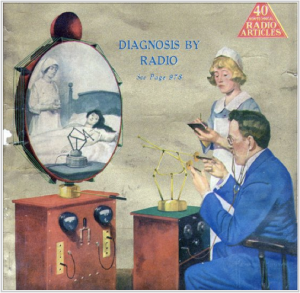 In the image to the right, (taken from the 1923 cover of Radio News), we see the futuristic imaginings of a doctor able do a house call with a patient remotely via his television and radio controlled robotic arms. This futuristic dream of telehealthcare would not have to wait long to become a reality. In 1967, the first close circuit television (CCTV) telehealth system was created and used at the Nebraska Psychiatric Institute (NPI). This was one of the first telehealth programmes, with a physical two‐way phone line connection between the NPI and the Norfolk State Mental Hospital, located 112 miles away. Since that time, videoconference teletherapy has only increased in popularity asking many psychotherapists to reconsider their traditional notion of what a session with a client looks like. There have been several major studies done in the area of videoconferencing. To date, no studies have identified any patient subgroup that does not benefit from, or is harmed by, mental healthcare provided through remote videoconferencing (Godleski, Darkins & Peters, 2012). It would seem that despite our common idea of therapy taking place in an office, in a face-to-face meeting between therapist and client, the experience of a video session is viewed as very effective and positive by clients and therapist alike. Clients who move away but wish to maintain their therapeutic relationship. Clients who live in rural or areas difficult to access therapy services. Clients unable to meet in person for psychological, physical or financial reasons. Clients who are unable to leave the home because they are caring for others. Clients who have limited time to commute to a session. Clients that travel regularly for work. In Ontario, a client must meet the therapist in person and have an established therapeutic relationship before switching to videoconference sessions. When meeting by video there are also some practical considerations to keep in mind. Are you well lit? Try to avoid strong shadows, back-lighting. Does the background contrast with what you are wearing? Are there personal artifacts in background that may be inappropriate? Can family members or pets be seen or heard during session? Are phones and other distracting noises turned off? Do your eyes meet the other person’s. Place their image under your camera to make sure your eyes meet. Keep your video window open to check for changes. Have you agreed to an emergency plan in case the media you are using fails? Have you spoken about what to do in the case of a health emergency/crisis? As with the advent of any new technology, only time will tell how videoconference sessions will change the way we think of traditional face-to-face psychotherapy. With greater accessibility and freedom of mobility, videoconference sessions may expand psychotherapy’s usefulness by taking out of the office and into the hands of clients everywhere. In the end, it seems that the medium by which therapy is provided is much less important to clients than the healing relationship that is created between therapist and client.